One of Ireland’s loveliest track walks follows the old Killarney-Kenmare road across the hills south of the Killarney Lakes. Fine views of hills and boggy moorland, and glimpses of the Killarney Lakes and MacGillycuddy’s Reeks. Killarney NP lies around and to the south of the stunning Killarney Lakes and is huddled under the first mountains of western Kerry. The lakes are studded with islands, and, with their mountain backdrops, are ridiculously pretty. 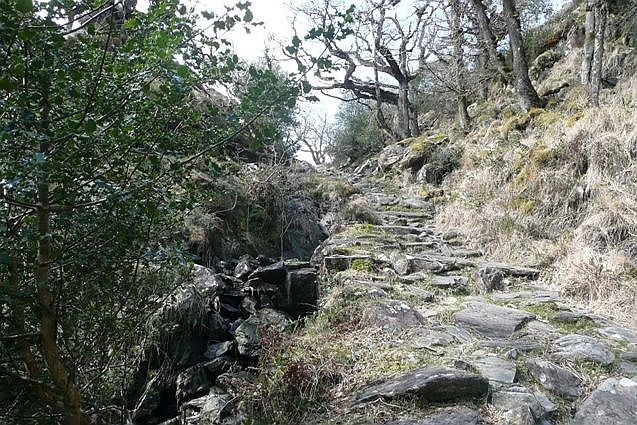 One of Ireland’s loveliest track walks is the stretch of the Kerry Way which follows the old Killarney-Kenmare road from just above the Torc waterfall across the hills south of the Killarney Lakes to the Derrychunihy church on the modern Kenmare road. It is, we guess, 8km of fine old graded track, which climbs through mossy, ancient woods up to the high moorlands and hillsides, where it meanders its way behind Torc and Cromaglan mountains before dropping to the church. Enjoy fine views of hills and boggy moorland, and glimpses of the Killarney Lakes and MacGillycuddy’s Reeks. You will particularly enjoy narrow, wooded little Esknamucky Glen. Climb Torc Mountain en passant if you are feeling energetic. The South-west gets a lot of rain and wind, plus cloud/fog and occasional winter snow on high ground. There is little shelter on the mountains, either from sun or rain. Be prepared, both mentally and with the right kit. See our Killarney NP and Iveragh Peninsula pages for more general and practical information and photos.